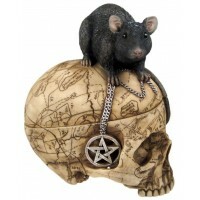 Unique skull statue has a map of Salem and a pentacle necklace decorates the top. Cold cast resin, finely detailed skull is 9 inches high. Decorated with a map of old Salem, Massachusetts, site of the infamous witch trials, a pentacle necklace decorates the side. Item Number: PT-9849 | Approximate Size (Inches): 4.00 wide x 4.00 deep x 9.00 high | Approximate Shipping Weight: 2.50 lbs.